The ZUK Z1 is the first phone from Lenovo backed start-up ZUK. It features a 5.5-inch 1080 display, 3GB RAM and Snapdragon 801 processor, upon which runs Cyanogen OS. 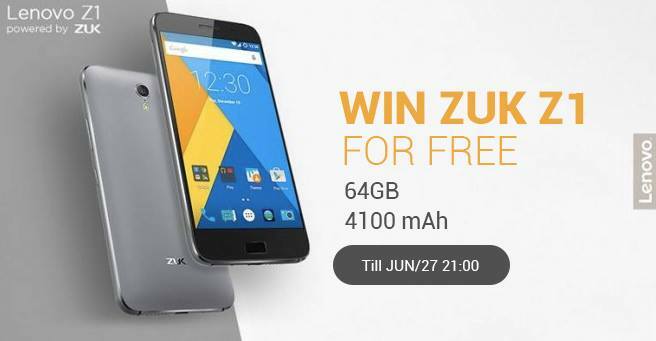 Cyanogen and ZUK are official partners for the ZUK Z1 meaning that updates and additional features will all be handled by Cyanogen OS. It is also one of the first devices to ship with USB Type C 3.0 for fast data transfer, quick charging and even audio. The Z1 also boasts a huge 4100mAh battery, fingerprint scanner, dual SIM LTE and outstanding audio quality. And with Google services installed, you can easily set the Z1 up as you want and really begin power using. 2. Now Complete Steps And Get Entries. Increase your chance to win zuk z1 by More Entries Also daily check the contest page. To be credited for a referral, your friends must complete at least one action.